can be to cut a border with Pinking Shears. or with a "pinking" blade on your rotary cutter. 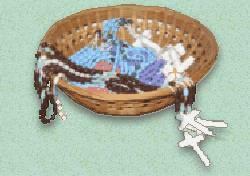 some will require the scapulars to be finished by this method. commonly known as the Brown Scapular. most will supply a volume of fabric which first must be cut into strips. which you must cut into specified lengths. With others, the Cord is pre-cut. may be easily mass produced. adjust the measurements to produce more. Fold a portion of wool over on itself to make 2 layers. With a chalk line mark the place to cut strips 2 1/2 inches wide . if you have never worked with them before. Cut right on top of the chalk line. The wool moves a bit while cutting. With a pinking rotary blade, cut against a straight edge ruler. into the same width strips, and stack the wool strips for later use. We will be working with strips 2 1/2 " wide x 10 1/2" long. Scapular Cord, called "Middy Braid" may be brown, black or white. Cut lengths of cord to your organization's specifications, usually 21 inches. Cords for Scapulars intended for use by adults are usually cut to this length. 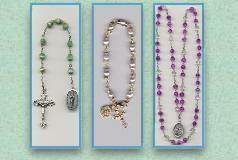 For children's Scapulars, 18 inch cords are preferred. on a flat cutting surface to 22 inches wide. Use inch guide on cutting mat or yard stick to mark out 21 inches. Place tape over cord., then wrap as shown. Secure the loops with tape at both ends, marking the cutting position. OR, cut cords individually to 21 inches. Leave one end taped for easy handling of cords while you work. Cord may be ironed if needed, with or without steam. Warm iron to silk/wool setting, NO STEAM, and test on a scrap image. will ooze out onto the wool. If it is too cool, and the image will not adhere properly. and 3/4" apart, enough space to later cut a 1/4" border between images. over the image. Pellon works very well for this step. Our Lady of Mount Carmel, pray for us! St. Simon Stock, pray for us! Prepare the word images in the same way on a single layer strip of wool. matching the pinked edges as closely as possible. with a bit of Liquid Stitch or other fabric glue. Allow glue to dry before sewing - just a few minutes. Cords may be pinned in place. Pin only the cords: do not pin the images. Center the cords between the edges of the image. Cords must be perpendicular to the images. Load Machine top spindle with white thread, bobbin with brown thread. On Pinked Border Scapulars, the images will be sewn on as well as glued. following the lines imprinted on the images. to permanently affix the image to the wool. Begin sewing at the point indicated, slightly above the imprinted line. and pivot the wool strip to align the right side of the patch for sewing. pivot at the bottom corner, and so forth. Lay the six finished Face Images out on your cutting surface. Grasp cords from each individual scapular between 2 fingers as shown. the Word Images wool strip. Liquid Stitch or pin the cords, centering them under the word images. Pin the wool strip together. the lines and finish at the top line, just as you did for the face images. about 1/4 inch from the edge of each. a border of wool approximately the same width on all sides. Hold up your finished scapulars and admire your work! tie cords in a "shoe lace" bow.